Sussex County Freeholder boss George Graham is desperate to change the subject in advance of the Freeholder Board's upcoming September 13th meeting. Remember that at the Board's last meeting, Freeholder Graham wouldn't allow public comment at a session devoted to the $500,000 "review" of the solar project. Taxpayers were made to grin and bear the fact that in January 2016, Freeholder Graham hired the same lawyer to review the project whose office had signed-off on the project in 2011. Graham is desperate to hide the fact that this lawyer was deeply conflicted, in the opinion of many. To get Graham's "version" out, the Freeholder boss turned to his old pal Bill Hayden, a Trenton-based bureaucrat at the New Jersey Department of Transportation. Hayden, who ran for office in June, is under some stress at work for allegedly running his blog on state time and posting threats about those associated with the Sussex County Republican Party. To get around this, Hayden's blog announced that it was "under new management" and then promptly went back to doing what the state told him not to do. Hey, when you are at work -- collecting a salary, benefits, and a pension courtesy of the taxpayers of New Jersey -- you should do what you are supposed to do. . . work! Taking a page out of convicted Bridgegate felon David Wildstein's book, the blog announced that a new editor named "Dan Haines" was now writing the stories. In fact -- just like Wildstein's "Wally Edge" (a long dead former New Jersey politician), "Daniel Haines" is long dead too. 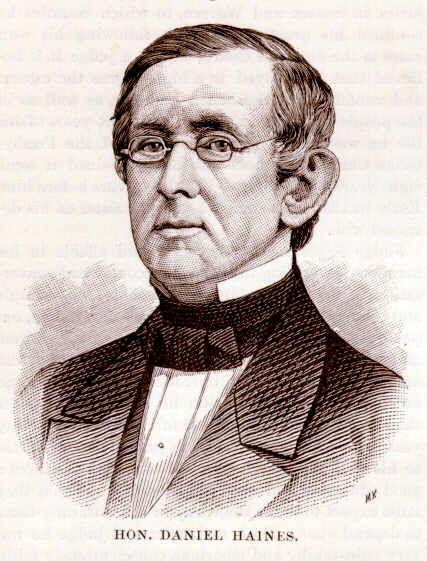 He was the 14th Governor of New Jersey (1843-45). He was born in New York City and died in Hamburg, Sussex County in 1877. The Facebook page of "editor" Dan Haines has him as being born in New York City and currently residing in Hamburg. Yes, these idiots are not much on imagination. Oh, and Governor Haines was a Democrat. Having a long-dead Democrat politician attack Sussex County Republicans makes a lot of sense, when you remember that George Graham was himself a Democrat -- a Hudson County Democrat, where the dead regularly vote! Yep, boss Graham sure does a lot of switching --from Democrat to Republican back to Democrat and now to Republican again. Want to bet what he'll be if Democrat Phil Murphy wins the Governor's office in November? So the "new management" thing is a lie. We expect other lies to follow, in what promises to be a sad attempt by Freeholder boss Graham to change the subject from why he wasted $500,000 on a report that nobody is allowed to question in public. It's sad because it won't work. The taxpayers of Sussex County are smarter than boss Graham and will demand to know why a 62-page report -- costing Sussex County taxpayers $500,000 ($8,064 per page) -- never once mentions the role of the office that signed-off on the project. And why Graham hired the lawyer who ran that office to do the review. It's the $500,000 question (actually $518,000 and rising) and the people want to know.